I’m often asked how long an elearning course should be. My quick response is that it should last long enough to meet your objectives. On the surface that’s not a bad answer, but it’s usually one that doesn’t satisfy either. 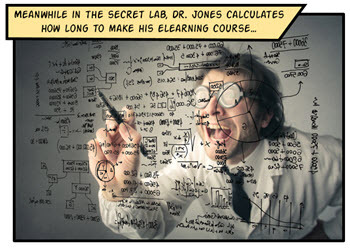 There are a few variables when it comes to determining how long an elearning course should be. However here are some tips that may help answer the question. The trend in online learning is small, digestible chunks. Some people call it YouTube learning. I like to call them coursels (as in course morsels). The trend makes sense. We’re using more and more mobile devices where quick hit training works better and chunked content is easier to process. By chunking the content you also have a more agile production environment. 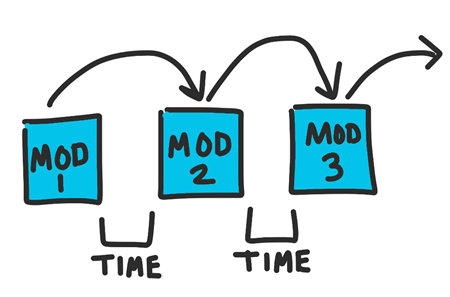 The modules are easier to update and modify; and they’re easier to move around to create custom learning solutions. As far as course length, with chunking it may be determined by the learner and not content. Some people may only need one chunk to meet your learning objectives while others may need more. There’s a lot of evidence that suggests that spacing the learning events over time may improve learning outcomes. Some organizations create coursels that are introduced over time. The first coursels introduce the big picture concepts and then over time the learning is reinforced through various activities that require recall and application. Years ago we built a training program where we had a few basic courses that highlighted the organization’s specific performance expectations. And then we scheduled a series of follow up challenges that required the learners to process various scenarios (using what they learned) and then discuss their solutions with their managers. There’s also an effective way to space training over a shorter period of time in a single sitting. The main idea is to present the course content three times divided by ten-minute breaks. It may look like this: 1) the instructor presents content, 2) 10 minute break activity, 3) students recall content, 4) 10 minute break activity, and 5) students apply the content to demonstrate understanding of content. I haven’t seen this approach applied to online learning, but I can see how this could work in a blended environment where live instruction blends with online content. In either case, chunking content and spacing out how it’s delivered changes our understanding of how long a course should be. 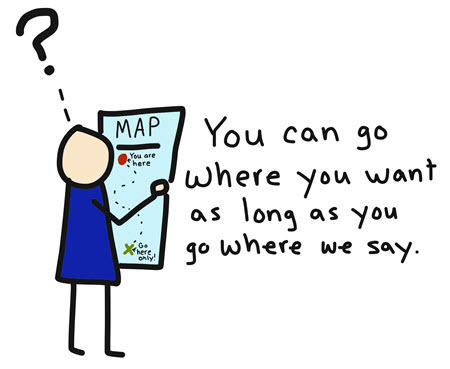 One of the great advantages of elearning is that it’s asynchronous which means it’s not confined by geography or time. That gives the learner the flexibility to take the course at a time most convenient to the learner. Another advantage is that the learning is self-paced, which directly relates to the question of how long the course should be. An experienced person may learn a lot faster than the new person. Thus, length of time is irrelevant. Take advantage of what elearning provides to create an environment that works best for the learner. Give them reasons to explore the course content. Have them prove understanding as a measure of success. Provide a lot of resources and guides to reinforce what they’re learning. Don’t lock navigation. Let them navigate the course as they desire. Check out more tips via this link. Often when people ask about course length they also ask how many slides or screens the course should have. Some of this probably comes from the presentation mindset where each slide represents X minutes and if you have a 30 minute presentation you’re constrained to X slides. However when it comes to elearning, slide count is irrelevant. The learner looks at a screen, they don’t look at slides. You can put five pieces of information on a single slide or spread that same information over five slides. To the learner it makes no difference. Essentially the screen shows content—mostly text and some sort of media like images and shapes. That content changes throughout the course. Does it matter if the content changes at the slide level with layers or by jumping to new slides? The end user only knows what’s displayed has changed. They don’t really care how you made it change. We all come to learning with different experiences and levels of understanding. Some people can pick up new content quickly while others may need more practice activities and feedback. E-learning is perfect for this approach because it’s flexible and can be tailored to learner needs and progress. However, any course you build is only a solution to meet specific goals. We don’t build elearning courses just to build courses. We build them to meet specific needs. Thus looking at the best length for a course is a bit misguided and focused in the wrong area. Ultimately we need to determine which intervention on our part helps the learner meet the learning expectations. How do you determine course length? Share your thoughts in the comments. We make CE courses, so they do have to be a certain total length – generally 2, 4, 6, or 8 hours. What we do within that course is break it down. Some courses have 100 mini-sections, and some courses have 5-10 modules that are 15-25 minutes in length. I do hate the formula of ‘X slides = Y hour course’ It DEPENDS! Completely changes based on how the content is provided and what the learner has to do. Tom, I am interested in taking the classes that you are offering in San Francisco this coming June. I have experience in developing the content and managing the flow. But I haven’t actually built a tutorial from scratch before and don’t have experience with the software. Would these sessions be too advance for me? Thanks. @Liz: the sessions would be perfect for you. I always have the beginner in mind when I develop these. The length of a course should of course be driven by the learning outcomes but in this less than perfect world clients want to know how much things cost (and they usually want them to cost less). So to guide our discussion I use the rule-of-thumb that we allocate one screen per minute. A screen may just be some text and an image, a click and reveal with multiple layers, a question with feedback or a more complex drag and drop. Based on this I then use the formula that it will take 1 day storyboarding per 10 screens and 2 days build per 10 screen in Storyline. So for a 20 minute ‘coursel’ total development time would be 6 days (2 days storyboarding and 4 days storylining). Clearly this doesn’t sound like the perfect pedagogical scheme but it at least gets the client to consider what is involved in building effective e-learning. By the way Tom’s tips are spot on…and love the graphics! Hi Tom, hope you are well. I have recently been commissioned to create an entire series of courses with the brief “No text, no voiceover, maximum length of 30-seconds”. Going to have to rely on mega-distillation of, and clarity of the message combined with super-effective “icon” based graphics. They have also got to make sense across any language. I think microcourses / “coursels” are the way of the future, so course length will become increasingly important as a concept understood by course sponsors AND producers. Very good article. I absolutely love this website. Keep writing!